This is a telephone conversation Charlene and I had when I went home more than a year ago. (Charlene is a grade school classmate, is thinner than me, and cracks jokes like she’s breathing them). We speak in our local tongue, but I’ve translated the conversation for this entry. “Yeah… and all that jazz.” My abdominal muscles ached after an excessive laughter. And that, Mr. Anonymous Commenter, is the reason why I've used and all that jazz—not so much because of its etymological background, nor its morphology, nor its meaning. I don't necessarily write to be politically correct or to be linguistically acceptable. The manner of my writing is almost like the manner of my speaking. I just happen to like the term, too. It's very musical, don't you think, Mr. Anonymous? This sounds too un-nationalistic. While the rest of the nation was witnessing Mrs. Arroyo's declaration of a State of Emergency because of a supposed coup plot, I and my dormmates decided to have dinner at Philcoa together. The meal was sumptuous. We had hearty, funny conversations. We then decided to go to Mercury (the drug store, not the chemical Jef messed up with) to check our weights, body mass indices (BMIs), blood pressures, and all that jazz. You see, there's this wonderful machine that automatically measures you, and all you have to do is drop a five-peso coin to check if you're still within the limits of obesity or kwashiorkor (no, it doesn't measure protein content). Paul V. was too mortified to know that he's still overweight, after those early morning and late-in-the-afteroon jogging sessions and rigid dieting. Paul B., on the other hand, couldn't believe his eyes: gravity was still pulling him down because his measured height didn't quite measure up to six feet. Anyway, I learned that I'm WAAAY TOOO underweight. I guess I have to eat five or more cups of rice now. Or maybe eat while sleeping. Or, why won't I quit MBB and shift somewhere else? Or maybe, just maybe, undergo an reverse-liposuction operation: instead of removing the fat, it will be injected to me. My mother celebrates her birthday today. I called her up early in the morning to say “happy birthday,” and she said thank you. I told her she was getting older, and asked her how she felt. 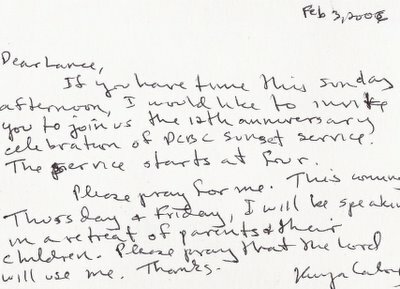 “Very blessed,” she said—blessed because of the Lord’s faithfulness in her life which she has experienced all these 50 years. My voice was still raspy because I didn’t get much sleep last night to review for my bio lab exam (which was scheduled today but was postponed because of the EDSA People Power commemoration). And so Nanay asked me how I was doing: was I tiring myself too much? 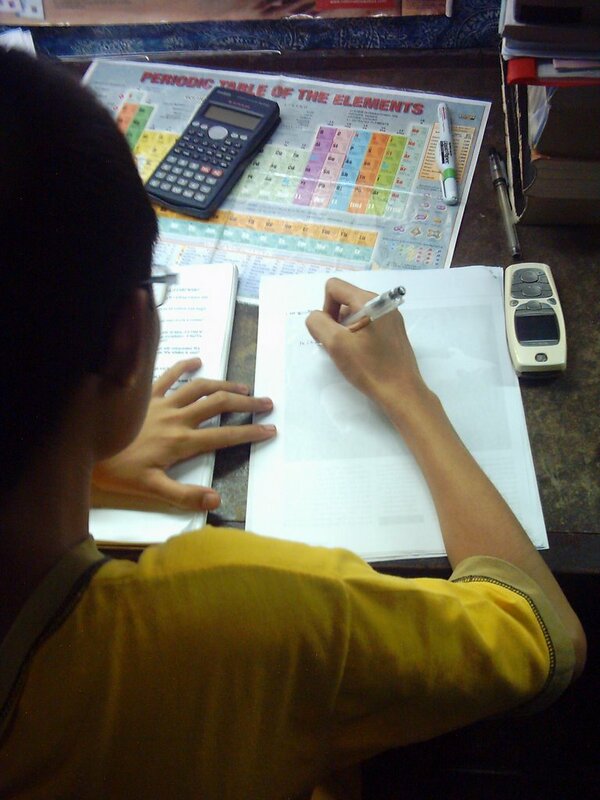 Was I pressuring myself to study harder when I ought to be sleeping? “I still have many terms to memorize, Nay, and I’m not done yet,” I said. “Of course, that’s biology. You will have to memorize everything,” she said. She further asked me if I was eating the right kinds of food—which can also be read as “Are you drinking your milk?”—among others. Nanay also asked if I’ve gotten over my drastic math midterm scores—which I still don’t know—because I’ve told her before that there’s a huge possibility of me failing it. “Of course,” I said—otherwise she might think I’d get suicidal. But really, the Lord has dealt graciously with me, allowing me to realize that even circumstances like these serve as means to expose my weaknesses and therefore allow me to seek Him alone for my strength. While writing this, I still have loads of muscles and bones and origins and insertions to memorize for tomorrow's exam. I wonder how my brain will respond to this information overload. Anyway, my brother got the results of the UP LAE (Law Aptitude Exam). He passed. I know he couldn't have done it on his own--even if he did his best. Our best isn't good enough sometimes, and yet it is the Lord who sovereignly gives us what we don't quite deserve. I know, too, that this achievement is all by God's grace. Had it not been for the Lord's mercies, he wouldn't have answered a single question in the exam. Here's the entry I wrote the morning he took the exam. It's worth re-reading, I guess. What an amazing grace indeed. 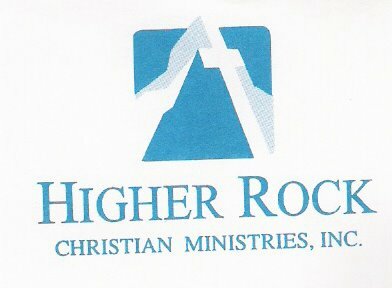 Today is Higher Rock Christian Church's tenth anniversary. The theme is A Decade of Grace and Life based on John 1:16 and 2 Corinthians 1:12. I’ve learned a lot of important lessons from Pastor Bob’s preaching—especially those concerning grace. So let me share them to you. We note that Jesus never used the word grace at all. We never read of Him speak such word in the New Testament. But He taught and lived it, and so should we. Love that goes up is worship. Love that goes out is affection. Love that stoops down is grace. In effect, grace is a free, sovereign favor to the ill-deserving. It's God's unmerited favor. Therefore, it is totally and absolutely free. If it were not, then it would cease to be grace. We also do not earn it because we cannot. For the Christian, grace is the good will of God towards us. It is this good will that establishes the good work—not the other way around. This is the heresy of humanism, the notion that man can, by toiling and laboring hard (and by good works), actually earn anything he wants--even the approval of God. The familiar phrase, God helps those who help themselves is never found in Scripture. What we do read in the Bible is that God helps those who are helpless, those who don’t quite measure up to His standards, and those who know of their lack and depravity. It's funny because my Sitemeter reveals that much of my blog traffic these days is due to Yahoo and MSN searches about the 2006 UPCAT results. If you are a freshman who took the most competitive college admission exam a.k.a. the UPCAT last year, I'm pretty sure you won't find your name here. My advice is to visit the UP website or you may want to check this out (I think they'll be posting it on the last week of Feb). If it is the Lord's will that you pass, then may He receive all the honor and glory. If you don't quite make it, I'm sure He has better plans for you. In any case, thank Him for His faithfulness. This is Ciara. She majors in Psychology. She's a professional dancer. 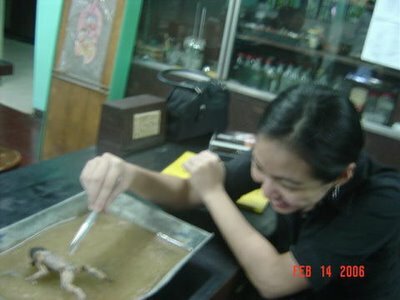 I mean, she can practically turn any simple move into a rhythmic movement--like frog dissecting, for instance. It makes you wonder why some people are just graceful. 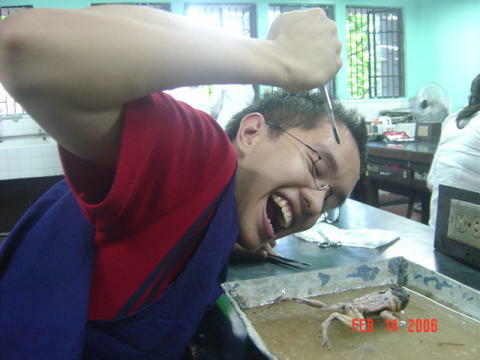 This is me with the frog Wegs and I dissected. Tired and nauseated by the formalin fume, I still managed to smile. I guess cameras do that to people. This may look a bit gory, but that's precisely the message I want to drive at. Mind you, it looks more awful when you see it face-to-face. But let us remember that the frog, naked and poised as he (or she) is, has merely fulfilled his (or her) lifetime goal: to become a specimen for the progress of biological knowledge. He's Juanchi. Another lab partner. He too majors in MBB. In this photo, he seems to be enjoying the prime of his life while the entire frog populace mourns for the loss of one of its species. But I guess that's taking it too far. Juanchi isn't barbaric at all, but a selfless Filipino who believes, with all his heart and mind, that no one can possibly quantify the impact a single frog can create in our world. Why do we all act like this? I guess Wegs's camera does many things to people. It destroys people's insanity for at least ten seconds. I’m not such a huge fan of Valentine’s Day. I think it’s just one of those dreary, ordinary days that, sadly, people think special—the day when one can, in the most creative and mushiest manner, show (or show off) his love for another person. But if this is the case, and if this is the reason for the celebration, then perhaps we might as well celebrate it everyday. Wouldn’t the world become a better place to live in if people actually do show their love for one another everyday and not wait for Feb 14 to become loving? But I write this because I’m bitter—NAAAH. Of course not. That could not possibly happen. The impossibility is like discovering a magnetic monopole (I’m applying my Physics concepts here, ladies and gentlemen). Would you really think of me as the kind of person who’d be shattered without a date? So anyway, let me tell you how I’ve spent my February 14. It all started with my meditation on Meeting Life’s Demands. I read Psalm 118: 1- to 18. I’ve been reminded that God is our strength, our song and our salvation. He is able to deliver us from the difficult experiences of life. And then my Math class. Feb 14 happens to be Noelizza de Leon’s birthday (the world’s population growth must peak during Valentine’s because I know many who were born on such day), so I excitedly greeted her when I entered the classroom. When Sir Chris Santos finally came, I yelled (at the top of my lungs), “Noelizza, happy birthday!” Sir must’ve heard me because he grinned, then said, “Sige, dahil birthday n’ya, magkukwiz [is this how it’s spelled?] tayo.” Thankfully, we didn’t. We now move on to Physics. Ma’am Jaki gave us a short quiz. The instruction was to enumerate five electromagnetic waves and their applications to our everyday lives. One of my answers was visible light—for illumination and photosynthesis. And then it hit me: do I actually photosynthesize? We immediately proceeded to Bio lab. We had a move-type exam—identification of a frog’s skeleton—and I was so disappointed because I didn’t get glenoid fossa right. Why, oh why, didn’t I get the glenoid fossa? It was “glenoid fossa” which my lips uttered over and over again just yesterday, and I didn’t get it when it was shown to me. Hahaha. The climax of this novel-length entry is the dissection. 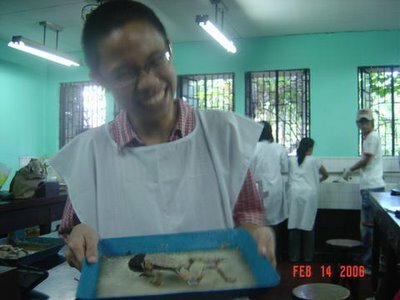 I spent my Valentine’s dissecting the poor frog (whom I wanted to name Kero-keropi but forgot to tell Wegs about it), skinning him, bathing him in formalin, and pointing at his muscles. And I’m not even sure if the frog is a he or she. After class, Noelizza invited me to a dinner with our other friends at Treehouse (in UP ISSI). It was a hearty meal: I ate like a pig because the food was soooo delicious. Valentine’s Day isn’t so stupid, after all. He also has a new blog. I've finally convinced him to start one. And I'm thankful he didn't really pursue his idea of naming his online journal Glassed (you've read the story, alright). Sean is the youngest in the family and, by far, the shortest—though I suspect that time will come when he will grow taller than me. But no! That cannot happen. Tonight, I shall take the vitamin supplements Tatay has, again and again, kept reminding me to consume. Back to Sean: he’s the sporty guy among the three of us. For instance, he was the first to learn to bike, to roller-skate, to shoot a ball, and to do many other things outside of the house, while I and Manong Ralph were so absorbed reading novels. He excellently plays table tennis—he has competed in various tournaments and won in them—and he swims pretty fast, too. When all of us took swimming lessons, all of our other classmates and even the instructor, were amazed at his dive. I thought it was a nice, little old dolphin doing the trick. "Sean, you miss me already?" "Ows? Na-miss na kita." And then I'd howl in laughter, knowing what his standard reaction would be: a distorted face forced to look frowning when, in fact, it's on the verge of actually smiling. "Hindi talaga kita na-miss, Manong (he calls me that, too)." This can be translated as: Yeah, yeah, sure I've missed you. 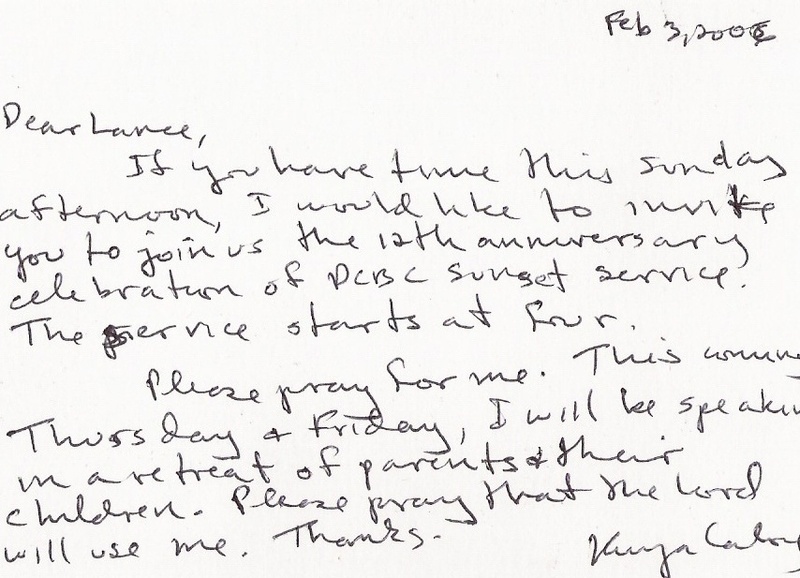 One of the greatest joys in one’s life is to receive letters from people. Of course, I get my daily dose of emails—mostly spam, forwarded messages sent to my Yahoo groups, and notices that someone has posted a comment in one of my entries. But I find real letter sending—the kind that uses pen and paper and envelopes whose flaps you have to lick so they stick—more meaningful. Why? Maybe because it requires extra-effort. Maybe because an ordinary person can only receive a few tangible letters in his lifetime—especially in the advent of the email and SMS. Or maybe because it’s more personalized. I’m not sure if you can relate with me, but reading from a person’s handwriting is different from reading, say, a letter encoded in Times New Roman, font 12. And when it comes to these things—to letter sending, thoughtfulness, remembering birthdays, pasalubongs, give-aways, and gifts—I never fail to forget Kuya Caloy Novisteros. 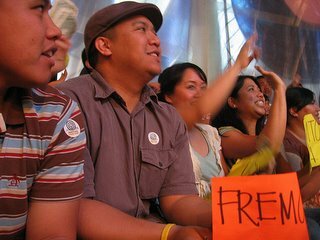 I first met him a year ago, when I attended the Kalayaan Christian Fellowship (KalCF). He had a camera with him, a small notebook, and a pocket-sized black Bible. He spoke about something—which topic exactly, I’ve now forgotten, because I’ve heard him speak so many times already. God has used him tremendously for His purposes. He speaks with such eagerness that infects you like chickenpox, except that it doesn’t cause spots, but a soul anticipating for God. He lives a life so reminiscent of Christ’s: a life of prayer, humility, availability, and service. Anyway, this is one of his short notes he's given me. He may have sent something for you, too: a note of encouragement written in colorful stationery, with your smiling picture enclosed. Someone from 5-Cat and Style Flyer tagged me. I didn't expect to be tagged by a cat lover (though I must admit, I like cats better than dogs). Post the 5th sentence (or closest to it). So, while waiting for the Molave people to prepare a feast for us (it's Molave's open house today), I've decided to kill time by playing this game. My 23rd post, Orange and Apples (not Orange and Lemons, the band) was written when I was bloody sick. I remember feeling cold all the time, wondering whether the sun was still warming the earth's biosphere. The fifth sentence of that post is At least, not yet. Like a tired soldier who has just survived a nuclear war, I marched out of my exam room at the NIP—with smiles and all—knowing that for the next 24 hours, I will be exam- and lab report-free. An hour ago, while I was still poring over my answers, helplessly trying to figure out to which direction this and that current goes (or if, in such a set-up, a current does exist), my classmates were already passing their answer sheets, and the room’s population was decreasing exponentially. There came a time when there were only less than ten people inside. While I was freezing inside—you see, the rooms in NIP are fully air-conditioned, you wouldn’t think of the Philippine climate as something tropical when you’re inside—Ma’am Jackie was chatting with my classmate. 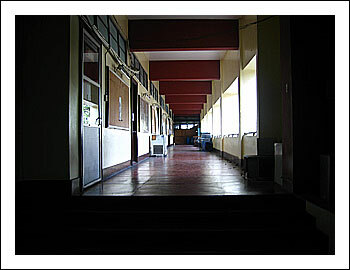 It was something about Baguio (my classmate was going there! ), I think, because I was half-listening to them while checking my answers (can be read as: I was eavesdropping). I decided to pass my paper, though I had two minutes more to spare. Pamela passed hers the moment I passed mine. Then we had a nice chat with Ma’am Jackie. We learned that she was going to give a report (she’s taking her PhD now) immediately after proctoring the exam. It took me quite a few moments to realize that my supposed hell week is now officially over. All praises be to the Lord. So what’s the matter with having extremely heavy and bloodshot eyes? What’s wrong with having hyperactive sebaceous glands excreting oil that polishes the skin like Johnson’s Floorwax? What’s wrong with getting less than eight hours of sleep? The world is just the way as it should be. I’m just tired. “If you’re tired, Lance, why don’t you go to sleep now and write this entry some other time?” Dear reader, if you do exist, I write this before I sleep because I want to record exactly how I feel. The good thing about a blog—or even a private journal if no internet connection is available—is that it enables you to document your memories properly. If, at a certain point in your life, you’d wish to peruse what you’ve written ages ago, you could always search your blog’s archive. This day proved monumental for me. I’ve had two exams: Chem 26.1 in the morning, Math 54 in the afternoon. Both were mentally—and physically—exhausting. Tomorrow, I shall wake up to a brand new day. I've just returned from an exam when I learned that the death toll in the Wowowee stampede has reached 70. The nation is mourning for this. After all, who would've imagined that the first anniversary of a silly (yet, for some, enjoyable) lunchtime show would turn out to be so disastrous? I'm too tired to write now, but Ate Rae Rivera (who also goes to Church as I do) wrote her opinion in an email sent to the Yahoo Group this morning. I just heard on the news this morning about the stampeded in ULTRA that killed 60 to 66 people [the death toll has risen]. 66 people trampled underfoot as people pushed their way into the stadium to watch WOWOWEE. It has been reported that many of these people were lined up since Wednesday and they came from all over the Philippines just to witness the 1st anniversary special of WOWOWEE. My mind is seething with disgust and pity at the senseless death of these 66 people. Disgust because I couldn't imagine how useless all the stampede was for. Pity because you see how useless the world's ambitions are. She goes on to say that as Christians, we should mold our minds to be like Christ. Mold it [the mind] to become like the mind of Christ. Cast down every argument and every lofty thing that exalts itself against the knowledge of God. Instead, bring every though into submission to Him. (Psalm 139:23,24; 2 Cor. 10:5). Be conscious of where you soak your mind, especially during your leisure time (Eph 5:16). Know what your mind is supposed to dwell on! (Phil 4:8). She writes that the cause of our death should not be the pursuit of vain and early things. She says, "I pray that when we do die, it will be a death worthy of our calling in Christ." It’s a dream that won’t come true for the next few days. A dream of sleeping the entire weekend off. A dream of going to Church without thoughts of impending exams. A dream of finally beginning Steinbeck’s The Grapes of Wrath. A dream of going to SM North and watching the latest and dumbest movies. But I might be dreaming of the wrong things. And somehow, the Lord, omniscient has He is, knows very well that it will do me more good if these wishes are not be granted to me. With all the strength I can muster, I awaken myself from this idleness and start burning the midnight candles. Paul and I were on the MRT. The train was like a can of sardines. It always is during rush hour. Between the sweaty bodies of people were small spaces comparable to intercellular spaces I see in my bio lab slides. This analogy, uhm, makes us the cells. I was holding on to him, and he was holding on to a vertical metal pole so when the train would suddenly come to a stop, we wouldn't be thrown away. I suddenly whispered, "Paul, someone's smelling you." He looked at me with shocked, disfigured eyes. And I knew at once that he became uncomfortable. Sometimes, I like making people uneasy, so I went on kidding him. "Paul, someone's really smelling you." I was giggling. "Paul, your scalp: it looks like a huge, spherical organ with lots of blackheads." "Paul, your head has a lot of moles. They can be cancerous, y'know?" I went on asking him questions like those until a huge part of the human population left when the train stopped in Cubao. Finally, we got a chance to breathe. And sit. Out of nowhere, he began giggling. "Lance..."
"I think you need a nose job." People who heard him looked at my face, their eyes searching for my flat, olfactory organ.